Lovie needs surgery - can you help? UPDATE 4/26/13: After all that Lovie has been through, she is doing well and has been adopted. UPDATE 4/22/13: Lovie’s mouth is healing nicely now!!! Those were the words from Dr. Robert Radasch on April 22, 2013, at Lovie’s final vet appointment. The acrylic piece was in her mouth for two weeks and that really helped the healing process. She still must eat soft food for a while and be careful playing (and of course, no chewies, crunchy food or hard treats) but she is well on the way to recovery now. Thanks for all of the positive thoughts that came Lovie’s way. She used every one of them. UPDATE 4/8/13: Lovie had what is hoped to be her last surgery to repair the hole in the roof of her mouth. Dr. Radasch crafted a different type of acrylic piece to cover the surgery site. So far it is holding and although Lovie is not fond of it and wearing the “cone”, she is tolerating both. She will see Dr. Radasch again in a week. Thanks for all of your kind thoughts and best wishes for Lovie’s recovery. UPDATE 3/28/13: Dr. Radasch was disappointed to note that Lovie still has a small hole in the roof of her mouth. Although smaller, it still needs to be corrected. He recommends one more attempt at covering the small hole with a skin graft. The positive is that the hole is smaller and the discharge from her nose has decreased. But TAGS cannot give up on Lovie now. We must try one more time. As you can imagine, the cost of Lovie’s medical treatment has far exceeded the original estimate. Please find it in your heart to make a donation so TAGS can take care of Lovie’s medical needs. Her next surgery is scheduled for 4/4/2013. Thanks for caring. UPDATE 3/13/13: Lovie’s second surgery was performed by Dr. Robert Radasch on March 12, 2013. He sutured the places where the original graft had not held. She should now be able to breathe through her nose normally. She went home this afternoon (March 13) (and boy was she ready!!!!). She is still required to wear the e-collar and eat very soft food for another two weeks. Hopefully she will be released at her next visit with Dr. Radasch in two weeks. Lovie has been through a lot, and the cost of her surgeries exceeded the initial estimates. She has now been in the hospital three times. Thanks for your interest in Lovie. Once Lovie is well, someone is going to adopt a fabulous girl!! UPDATE 3/10/13: Lovie is scheduled for her 2nd surgery on Tuesday, March 12th to fix the area that we hope is still only about ½ cm wide and 1 cm long that is still open. We are hoping that the hole will completely heal closed because it is causing her food to go into her nostrils and makes it hard for her to breath. Wish Lovie luck. TAGS and Lovie thank you for your generosity and care! TAGS is greytful for all of the thoughts, prayers and good wishes for Lovie’s recovery and for all of the generous donations. If you would still like to make a donation please click on the “donate” button or mail a check to TAGS at P. O. Box 703782. Dallas, Texas 75370-3782. Please think positive thoughts for Lovie’s recovery. UPDATE February 27, 2013: Lovie was given light anesthesia and her mouth was thoroughly examined by Dr. Radasch today. The graft has held for the most part, but there is an area ½ cm wide and 1 cm long that is still open. Therefore, Lovie continues to get food and other debris in her sinus cavity. Dr. Radasch wants the graft to completely heal and then he will stitch the small portion that is still open (in 10 to 14 days). Lovie is not pawing at her face so she has been “released” from the hated e-collar. She is also allowed to start eating soft food that is more substantial than the soupy gruel she has been eating. Poor girl has lost weight so hopefully she can now eat more and gain some of the weight back. She will continue to take the antibiotics but is no longer taking the Trazadone, Tramadol or Rimadyl. Her progress will be updated after her next vet visit. UPDATE February 26, 2013: Lovie has an appointment with Dr. Radasch at the Dallas Veterinary Surgery Center on Wednesday, February 27, 2013, to check on the status of her recovery. Wish her luck!!! UPDATE February 14, 2013: The very determined Lovie got the acrylic piece out of her mouth on Wednesday and was taken back to the Surgery Center. She REALLY did not like the bulk in her mouth and did not like not being able to fully close her mouth. Dr. Radasch replaced the acrylic plate with a smaller one and she had that one out of her mouth in 2 hours (while at the Surgery Center). She stayed at the Surgery Center on Wednesday night and will spend the night there again tonight. Dr. Radasch said the surgery site looks good and hopefully she will not bother it. They are keeping her lightly sedated and calm and so far it seems to be working!! She’s much happier without a foreign object in her mouth. She is eating and drinking and they are hopeful she can go home tomorrow (Friday). UPDATE February 11, 2013: Lovie came home the afternoon of Monday, February 11, 2013, with an Elizabethan collar firmly attached. The issues she is facing now are not knowing how to eat or drink with a foreign object in her mouth (the acrylic covers the entire roof of her mouth and she is unable to close her mouth all the way) and wanting to get the collar off to paw at her face to get the acrylic out of her mouth. She’s a very determined girl and it takes some effort to keep her calm, but sedation is helping. According to the vet, it will just take time. Thanks for thinking about her. UPDATE - February 8, 2013: Dr. Robert Radasch performed surgery on Lovie’s mouth this afternoon. He called at 5:15 p.m. and said the surgery went well. He covered the hole with a double flap as planned. He said there was considerable debris in Lovie’s nose and sinus, which he cleaned out. We had planned to pick up Lovie in the morning but Dr. Radasch wants to keep her until Monday to make sure she is eating and drinking properly with the plate in the roof of her mouth. The extra hospital stay will increase the cost, but TAGS will do what is best for Lovie. Hi everyone. My name is Lovie. 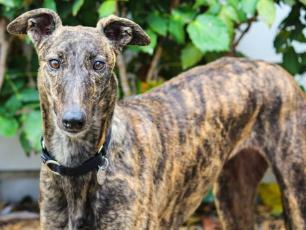 I am 2 ½ years old and was training to be a racing Greyhound. While I was training, I was bitten on the top of my snout by a dog of another breed (not a Greyhound). It was a pretty bad bite so I had to stop training. My wounds healed some time ago on the outside but I was never the same. After that I made snorting noises when breathing and I sometimes have trouble getting my breath when I get excited and when I eat. I have been with TAGS since the end of November, 2012. When I had all of my medical done (yuk), the vet said that I had a "hole in my hard palate" - whatever that is - and that I needed to go to a specialist to see if surgery would correct my problem. My foster mom took me to see Dr. Robert Radasch at the Dallas Veterinary Surgical Center. He was very nice and pet me all the time while he talked - except when he made me open my mouth so he could get a good look. I didn't really like that, but I was a good girl. He said he thought he could help me. What he told my vet and TAGS is this: I have a hard palate lesion on the right side that is 3/4" to 1" long and about ½" wide. There is food impacted in the hole. I have a lot of nasal discharge and likely have secondary rhinitis/sinusitis. What Dr. Radasch suggests is that he perform surgery and make a double flap to cover the hole (kind of like a skin graft). He said it will have to be covered with an acrylic plate over the repair for 2 or 3 weeks. He also said I will need to take antibiotic pills for a month after surgery. None of this sounds like something I will enjoy, but I know it must be done so I will get well and hopefully can breathe normally and not have more sinus infections. I don't really know anything about this part, but I heard the TAGS people talking about how expensive it will be. The low estimate is $1,540.00 and the high estimate is $1,900.00. It will also cost more for me to go back to see Dr. Radasch after surgery and have the acrylic plate removed. TAGS would like for you to make a donation to help pay for my surgery. TAGS needs to raise the money before the surgery is done. I would like to get well very soon and get this behind me. I'm ready to find my forever home and not have to worry about the hole in my mouth and sinus problems. 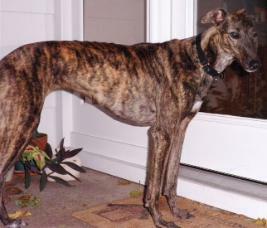 I just want to have a home of my own and be loved by a family like the other TAGS Greyhounds that have been adopted. Please make your donation through Pay Pal online or send a check to TAGS at P. O. Box 703782, Dallas, Texas 75370-3782. I hope to meet you soon. I'll give you a Thank You kiss in person. Thanks for helping me. Click the 'Donate' link above to donate to help TAGS cover Lovie's surgery. Please specify in the description that the donation if for Lovie.